One of the most exciting things about a formerly-niche technology becoming mainstream is the way it mutates and evolves by means of its end users’ ingenuity. One famous example could be the case of a product that was originally meant for cleaning coal residue from wallpaper, and eventually came to be the Play-Doh today’s children know and love. Ever since Barack Obama proved big data can help win the presidential elections, politicians have started taking data more seriously than ever. it was in this relatively-new space that Known Factors, a veteran BI consultancy catering to a wide variety of industries, found it could provide a new and valuable service to its clients from the political world. With the growing demand for precise, targeted and timely data, Known Factors needed a way to provide candidates and incumbents with a way to visually access data in the relevant voting districts, perform their own analysis and divert their efforts and resources accordingly. The consultancy managed to deliver this service by implementing interactive BI dashboards. After creating a data warehouse based on a wide range of relevant data points, including voter attributes, previous election results, campaign finances and more, they then built a series of dashboards and reports which pulled in the relevant fields, and allowed the candidates to perform statistical analysis on the voting district in question. Using these dashboards, the candidates running for office could use drills and filters to locate potential voters and target them with the right materials based on demographic and other publicly available relevant information. Furthermore, it helped them find areas rich with swinging or inactive voters and run effective campaigns in those neighborhoods where voters would more likely be swayed. The consultancy even maps the best routes to travel so that the politicians could reach these impressionable voters first. 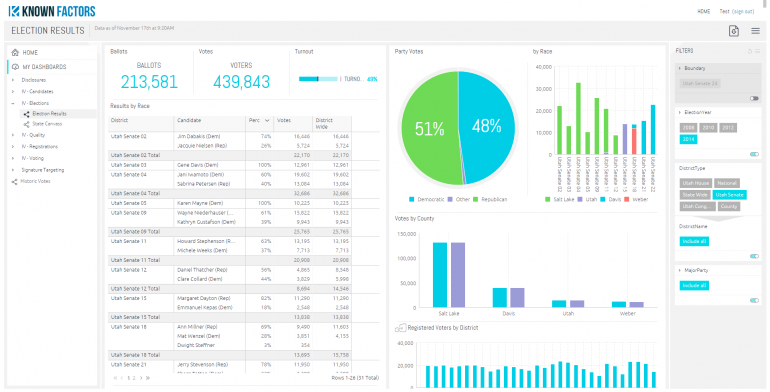 By implementing a modern BI system, Known Factors enables every candidate running for office to easily sift through troves of complex data and leverage the results for more accurate campaigning – without investing the hundreds and thousands of dollars that would be needed in order to gather, prepare and analyze this data on their own accord. Skullcandy is a Utah-based, publicly traded company that markets headphones, MP3 products and other electronic devices to consumers in general and outdoor sports aficionados in particular. As a global retail enterprise, Skullcandy was rapidly gathering data, coming from diverse sources such as ERP, marketing, internal budget information and more. The legacy tools the company had in place were having difficulties keeping up with the need to consolidate all the data into a single source of truth, as well as provide insightful data visualizations to various departments. The company clearly needed a fresh start in terms of business analytics. They soon found a BI software tool that could accommodate their needs, but this gave rise to a new challenge: how to get the entire company on board with the new system and drive adoption across departments? The solution was as simple as it was brilliant: hold a contest. And so, on the same day they finished implementing the new analytics platform, they also launched a dashboard contest to see which department could create the best BI dashboard. Over 40 employees chose to join the competition, which was eventually won by the HR department – who successfully built a dashboard that revealed great insights into employee retention, salaries by gender and more. Not only did the contest lead non-technical users to experience and make practical use of the business intelligence system in place, training themselves to become well-versed in using the system in the process, it also helped Skullcandy identify the specific datasets which most people in the company needed to use. This one simple and fun management decision turned the entire company more data-driven and efficient. Juwai is a growing web company that provides an online marketplace for Chinese buyers to identify international real-estate to purchase worldwide, with the service currently offered in close to 100 countries. Millions of such properties are currently listed on the site, providing a platform for thousands of daily interactions between real-estate agents and buyers every day. Naturally, all this online activity is captured on Juwai’s servers and consequently generates proper Big Data – billions of rows coming from multiple sources, both Western and Chinese, with each user interaction adding to this massive database. Juwai was using Excel and homegrown systems to process the data and generate reports, but as the company grew they came to realize a more robust reporting and analytics solution was needed. After implementing said business intelligence solution, Juwai immediately realized the ‘expected’ benefits : data was both readily available and more consistent and reliable than before, reports could be generated easily and quickly without taking up IT resources, and executives could see a bird’s-eye view of trends and developments in the business. But in addition, Juwai found an innovative way to use the eye-catching data visualizations it could now create – namely, to generate more enticing PR materials to generate press interest. Using their BI tool, Juwai’s Public Relations department can uncover interesting insights about the Chinese market’s behavior and global assets that are garnering attention. These insights could then be transformed into nifty data visualizations to enhance the company’s press releases and help it gain more mainstream media attention, as can be seen in this coverage in the Wall Street Journal. By combining interesting pieces of information gathered via data analysis with easily digestible data visualizations, Juwai can give reporters an interesting story to write along with the facts to back it up, while at the same time supporting its own PR efforts. Discover additional ways data analysis is changing the way companies do business by visiting our business intelligence case studies.